Whether you're a daily driver searching for a dependable quality upgrade from your current OEM radiator, or you're a devoted racer who needs a lightweight, high-performance radiator, Mishimoto has just what you're looking for. Many drivers overlook the importance of having a high-quality aluminum radiator installed, yet it is one of the most important components in your vehicle's engine. 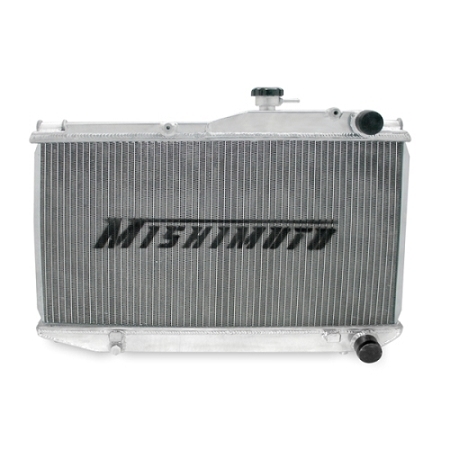 Mishimoto performance radiators are designed to efficiently reduce the heat from vital areas. Made with 100% brazed aluminum for a clean OEM fit, Mishimoto performance aluminum radiators ensure excellence and a lifetime of efficient cooling. Perfect for any turbocharged, supercharged, or nitrous-oxide engine. Check out Mishimoto's silicone hose kits and aluminum fan shrouds both make a perfect match with thier aluminum radiators. Overall Size: 23.2" x 18.3" x 3.8"
Core Size: 12.60" x 25.28"